Our fluid enables your best reservoir environment. It's field proven, having efficiently delivered highly productive wells for more than 15 years without any well control incidents at temperatures as high as 235°C/455°F and pressures up to 1,126 bar/16,331 psi. Effective drill-in fluids. Our enhanced reservoir fluids made from non-damaging, low-solids cesium formate brine are ideal for reservoir drill-in operations with minimal risk of formation damage. The extremely low equivalent circulating densities (ECDs) make it suited for wells with narrow windows between pore pressure and fracture gradient. It has helped simplify operations, protect assets and optimize production in numerous drill-in applications for leading operators such as Statoil, BP and Petrobras. Those operators that use it both for drill-in and completion operations see the largest efficiency gains, including elimination of clean-up time. Ideal for sandface completions. Successful in over 350 applications worldwide, our brine has been shown time and again to optimize operations in harsh environments. A recent independent study by well consultancy Ridge AS concludes that formate fluids outperform other fluids to deliver significant rig-time savings. Non-damaging gravel-pack fluid. The clean, non-damaging nature of cesium formate brine makes it compatible with the formation and its natural high density is ideal for carrying gravel and providing hydrostatic support. If a viscous gravel-pack fluid is required, our brine can easily be viscosified with xanthan to provide an effective solution. Run screens solids free. No weighting agents mean no risk of screen blocking, making enhanced reservoir fluids made with high-density cesium formate brine ideal for running screens. Furthermore, buffered cesium formate brine is highly compatible with downhole metals, negating the need for corrosion inhibitors. The clean way to perforate. Clean, non-damaging enhanced reservoir fluids made from cesium formate brine are perfectly suited for challenging perforating operations. Field proven at high temperatures and pressures, our brine delivers successful perforations with maximum well control and minimal losses without compromising production. Safe long-term suspensions. When traditional solids-laden well construction fluids are left in an openhole for months or years, there is risk of formation damage, screen-plugging or hard-to-remove filter cakes. Low-solids, non-damaging formate fluids are safely left in contact with the reservoir for extended time periods. With cesium formate brine’s unreactive nature and natural density to 2.30 g/cm3/19.2 lb/gal, solids content of drill-in fluids is minimized and the likelihood of delivering highly productive wells with no formation or completion damage is greatly increased. Low-solids fluids with good fluid-loss control can also be formulated with biodegradable biopolymers, such as xanthan. Cesium formate brine protects these polymers to high temperatures, making them suitable for high-temperature applications where synthetic polymers would otherwise be required. Improved well control. Low-solids drilling fluids based on cesium formate brine are proven to provide superior well control over traditional solids-laden, oil-based and water-based muds. The high-density, solids-free nature of cesium formate brine eliminates the need for weighting solids, resulting in a safe fluid that facilitates fast and efficient drill-in operations. Save time by drilling and completing in the same fluid. By using versatile cesium formate brine for both drilling and completion operations, time-consuming fluid displacement operations between the two phases are eliminated and costs are saved. Corrosion protection. Cesium formate brine is highly compatible with downhole metals. With its monovalent and alkaline properties, our brine buffered with carbonate/bicarbonate provides corrosion protection in harsh carbon dioxide- and hydrogen sulfide-rich environments without corrosion inhibitors, even maintaining favorable pH after large influxes of acid gas. Safe for rig crews, safe for the environment.High-density cesium formate brine is much safer to handle than acidic halide brines. Rig crews work more effectively as no specialist personal protective equipment is needed. Equally, cesium formate brine has low environmental toxicity and is considerably safer and more environmentally compatible than alternative high-density fluids. Thermally stable and highly durable. Cesium formate brine has proved thermally stable and highly durable in over 150 high-pressure high-temperature (HPHT) wells. Our brine has been exposed for up to two years to well temperatures as high as 235°C/455°F without any substantial changes in composition or essential properties, including density and pH. No stimulation required. Ultra-thin filter cakes formed from cesium formate brine lift off very easily. Although these thin calcium carbonate filter cakes are acid soluble, no filter cake removal treatment has ever been required. Furthermore, our enhanced reservoir fluids minimize risk of stimulation later in the well’s life. Cesium formate has been used by leading operators around the globe since 1999. This remarkable brine has helped deliver the full value of reserves with less time, risk and total cost time and again. 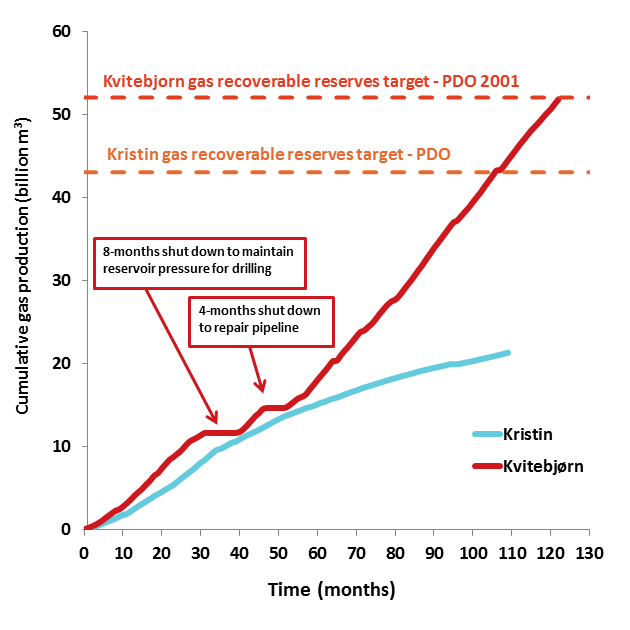 Operators continue to benefit from the superior performance of cesium formate brine, as depicted in the excellent production from the Kvitebjørn field. The Kvitebjørn wells were primarily drilled and competed openhole with cesium formate fluids. The Kristin wells were mostly drilled with oil-based mud and completed with screens in oil-based mud or cased and perforated. The wells cleaned up naturally, without acidisation, using a rapid bean up method that achieved full clean up within 11 hours. The low-solids loading of the formate fluids ensured that the well test separators were not damaged or blocked by back-produced solids during the clean-up phase. Multi-rate well flow testing showed that both wells could produce at an absolute open flow (AOF) of more than 150 million standard cubic feet per day (MMscfd), which is 50% higher than the original technical potentials estimated in the field development plan.